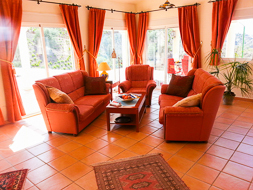 This lovely ground floor villa offers accommodation for 6 + 2 persons. 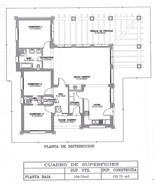 This detached villa has a floor surface of 109 square meters, equal to almost 1200 square feet. The total property is 5550 square meters, from which 1200 square meters (roughly 13000 square feet) are on flat surface. The swimming pool is 8 by 4 meters (26 by 13 feet) and is attached to the terrace through a tiled pathway. The large terrace (75 square meter, 800 square feet) is furnished with luxury chairs and a dining table, as well as comfortable lounging chairs that can be transformed to a sunbed. The second terrace is provided with a brick barbecue that can be shielded with a windshield. Tables and chairs are provided so that barbecue events can be organized. The third terrace adjacent to the pool is provided with sunbeds that can be shielded off using the solar sail.The property also has private parking space for more than three cars. The well furnished villa is new and comfortable. It has a terracotta flagstone floor, which is extended to the terrace. 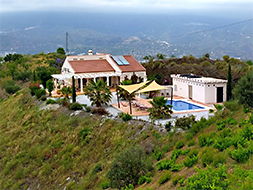 The whole villa is equipped with central heating and air conditioning, so that temperatures can be regulated in accordance with one’s preferences. All accommodations are accessible for wheelchairs. In the cosy living room there are two sofas, an armchair and a sofa that can be used for sleeping. There is also a television with HD connection to a satellite dish (astra) and a DVD player available. Guests can connect to the internet using a fast WiFi connection. The living room has four sliding doors to the large terrace. The open kitchen is equipped with a dishwasher, a four-pit ceramic stove, a microwave, a hot air oven and a combined fridge freezer. The dining table is available for use by up to 8 persons. In the scullary you will find a washing machine, a drying machine and an extra freezer. Lastly, the shed contains a water softener. The villa has three spacious bedrooms. Two of the rooms have two single beds each. These bedrooms have a common bathroom with a shower and hand basin. The third and largest bedroom has a double bed and attached bathroom. This bathroom has two hand basins, a bathtub, a shower and a toilet. All bedrooms have spacious wardrobes and comfortable box-spring beds of 90 by 200 cm (roughly 3 x 6.6 feet). Living room: 7,1 x 4,6 m.
Kitchen: 4,7 x 3,5 m.
Bed rooms: 3,4 x 3,0 m for the smaller rooms and 3,9 x 3,4 m for the bigger room. Swimming pool: 8,0 x 4,0 m, depth: from 1,2 to 1,8 m.
1 meter =3.2808399 feet (3 feet 3⅜ inches).